Moscow, Russia (CNN) -- The death toll from a Russian coal mine accident has reached 52, with 38 people still missing, the Russian Emergency Situations Ministry said Tuesday. "The rescue operation to locate and recover the missing people is being carried out around the clock," Veronica Smolskaya, spokeswoman for the ministry, told CNN. 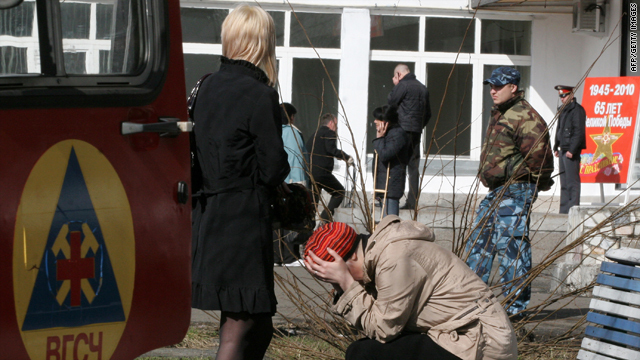 More than 80 survivors are currently in hospitals, according to the Russian State Health authorities. Emergency Situation Minister Sergei Shoigu said more than 700 rescue workers are now combing numerous underground tunnels of the mine, and the plan is to complete the operation within the next 24 hours, according to the ministry's website. He was speaking at a special meeting of the rescue headquarters in Kemerovo region, which was also attended by Russian Prime Minister Vladimir Putin, who traveled to the region Tuesday. Russian officials are still displaying hope and optimism in public, but several sources at the mine told Russian reporters on conditions of anonymity that finding anyone underground who survived the explosions would be a miracle. "Hope is always the last one to die, but there is indeed little hope left," Sergei Cheremnov, spokesman for the local regional Kemerovo governor, told CNN on the phone from the site of the accident. Cheremnov also said the first six funerals took place Tuesday. Five miners were buried in the town of Mezhdurechensk itself, where the accident took place, and one was buried in the town of Tashtagol, also in Kemerovo region. The gas explosion in the Raspadskaya mine occurred around 8:55 p.m. Saturday (12:55 p.m. ET), when 359 people were working at the time. The mine is located near the western Siberian town of Mezhdurechensk, more than 2,300 miles east of Moscow, Russia. Almost 300 people were evacuated shortly after the explosion. More than 50 rescue workers had gone into the mine to recover the rest of the victims when a second gas explosion rocked the structure about four-and-a-half hours later, officials said, causing more fatalities and destruction. Dozens of miners and rescue workers were trapped as a result of that second, much more powerful explosion, and all communications with them were disrupted. Thick smoke and high methane concentrations in the mine prevented active rescue operations underground on Sunday and most of Monday morning, Russian officials said. The operation was further complicated by the very size of the mine: Raspadskaya is one of the largest in Russia's mining industry. It has dozens of underground tunnels with a total length of almost 200 miles, according to Kemerovo Gov. Aman Tuleyev. Putin said on Russian state television Tuesday the investigation is closely analyzing all possible clues to determine the cause of the blasts. "When such disasters are investigated, attention is always given to studying all aspects of the problem, including the so-called human factor, which means unsafe handling of fire," Putin said while talking to victims' families. But once the groups of rescuers entered the mine after the first blast, he said, "there could have not been any unsafe handling of fire or equipment. It's simply out of the question," he said. "The second blast was the hardest." The victims' families will be paid 1 million rubles (more than $33,000) in moral damages, and underage children of those killed in the accident will be paid a pension of 10,000 rubles (more than $330) every month until they reach the age of 18, the Russian government decided Tuesday. The injured will receive 400,000 rubles (more than $13,300), and miners sustaining light injuries will receive 200,000 rubles (more than $6,600). Local authorities and the management of Raspadskaya mine will also allocate money to those affected, in addition to the federal government. On Tuesday, the first working day in Russia following three days of the May 9 Victory Day holidays, the shares of Raspadskaya mine plummeted by 15 percent at the Moscow stock exchange.